Food is very important for us to live. There is no goodness anything if it is food if it fills one's belly. Still, it is important that food is nutritious. I want to know be nutritious what kind of food. 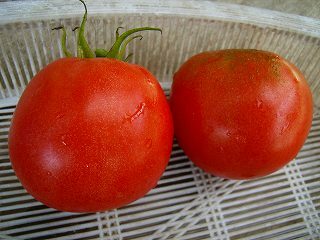 The tomato is an annual herbaceous plant of the eggplant department of which the origin Peru, and is Ecuador. It seems to have been enjoyed chiefly that it was told to Japan by Portuguese in around 1580 for appreciation. It is from the 1955's to have come to be able to eat in full scale among the people though used as "Pinko eggplant" for the European food for the Meiji era. I was still a grade-schooler in those days. The taste of the tomato ate in old times was the smell that seemed to be fairly the tomato from now and delicious. I think that a peculiar smell is few of a tomato today why. How though nourishment only has not to be a little either? When it eats the one of the season within that time frame, nourishment is also good a lot of tastes. Moreover, there is no hand doesn't eat if becoming it when it is healthily good. Let's become healthy eating fast. If it is possible to grow it for myself with no agricultural chemicals, it never says. It was in the health information, and has brought the page concerning food and nourishment together in an independent genre "Food and nourishment" up to now. I want to enhance the page little by little in the future.